beauty of the creek. The natural wood trim, large wood cellar doors, and travertine wainscot provide Ambrose Hall with the elegance of a grand hotel or winery. 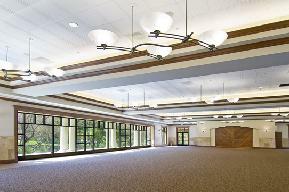 The Shannon Community Center rooms are available for rent. Click on the links below for more information.